The home is only rented by the week, no partial weeks. Partial weeks will cost an entire week. Great Stay! Loved the Grounds! The house was clean with everything we needed inside (you should check what is here before shopping for the week as many items are already here) . We were quite glad the location was on the (more peaceful) south side as the traffic to the north was nearly unbearable (during this spring break time period) It was not uncommon to take 20-30 minutes to get to the North end after about 11am) We found everything we needed going South over the Big Carlos Pass bridge (to Bonita Springs direction) with no traffic. (There are restaurant/bars and shopping going to the north (left) BEFORE you hit traffic (within a mile) so those were great options as well) There are trolley stops not far from this property going in either direction (small fee required). Great Stay and was perfect for our group of eight! Beautiful gardens and location. Weather was bad first part of week but we enjoyed relaxing in the many places to sit outside when sun finally came out. House was well appointed and comfortable. We played golf, shopped, collected shells at the beach and enjoyed a number of good restaurants. The owners, Nick Borragia and his wife, were very friendly and helpful. Overall very good experience. Would highly recommend this place. Relaxing. Home had everything you need and owners made us feel at home. Accommodations were lovely and close to all activities. Nick was great to rent from. First, if like me you have stayed in places with a horrible beds you wont have a problem here. I have spinal issues and was so comfortable both inside the house as well as outside. If you are looking for a island feel on the beach this is it. Totally private and abundant quality shells just washing a shore everywhere . If you have longer to stay you can drive a few miles to great shopping and uperscale restaurants. You have it all at this location. My only disappointment was we couldnt stay two weeks to really enjoy it all and was there during the tropical rains so i couldnt take full advantage of all that the property had to offer. I really cant say enough to express how great it was. Im very picky on where i stay and wish there were more of this type of properties out there. You wont be disappointed I promise. Nick is avaiable if needed and if not you wont be bothered. It was only my husband and I but it would be a wonderful place to host a event as the grounds are amazing with so many different sections with every type of relaxing but private areas. If you book here you will discover something new each time you walk through garden areas. WELL DONE NICK!! I wish I could wake up to that every morning. My dream back yard... My husband walked to beach each morning to watch dolphins in the water rain or shine. We are from NW Indiana near chicago and it was a GREAT FIND! The living area, kitchen and bedrooms all have views of the beauty of tropical but serene gardens that young or old will enjoy... Everything you need is there. Incuding out door shower ( with warm water not cold) you can rinse off the enjoy the large covered lanai with top quality furniture and hanging swing. If comfort is a must then this is it. Thank you nick for being so easy to deal with. Wish we had more time to have spent getting to know you. I usually dont take time to do surveys and was not pressed to do so but dont want anyone to pass this up . Alot of work put into this place for your comfort or event if needed. I cannot say enough about this incredible property! It is so far beyond anything we had hoped for! The gardens are gorgeous, and so if the weather is even a bit less than perfect, there is always beauty around to enjoy. The home is comfortable and perfect to entertain family and friends. Nick is a special, gracious host. Of all the places we have traveled to, this is by far one of the BEST! We loved it and hope to return!!! 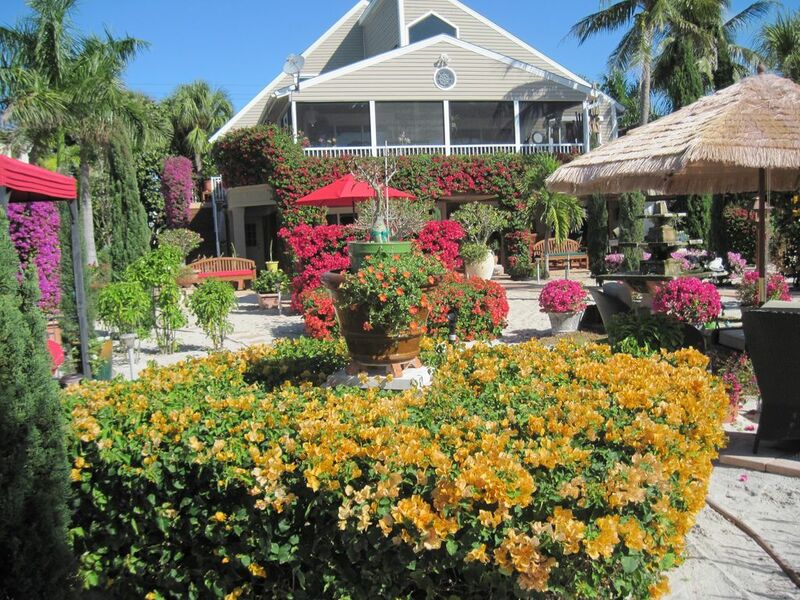 The home is located on Ft Myers Beach a resort community with every vacation amenity imaginable. Ft Myers Beach is a family oriented vacation destination. The home isn't a typical rental. It is very upscale, newly constructed as well as direct ocean front with crown molding, large base board. stained glass. Hand painted floor lanai. Beautifully decorated and appointed and extensive resort like private gardens and much more. Ft myers beach is within minutes of the city of Ft Myers, Naples, Captiva and Sanibel Islands. Cancellation policy: Reservation prepayments will not be refunded unless the home is re-rented for the same rental amount and time period reserved. The cancellation must be 90 days prior to arrival or there is no refund. Refunds before the 90 day window are subject to a $400 service charge. Early departure from property for any reason does not warrant a refund.